I set a June 1 deadline for getting my contribution to the "Inspired by Japan" benefit portfolio printed and ready for mailing. I have some other big June commitments and know if it doesn't get done by then it won't be finished in time. Consequently, I've been printing rather frantically. I got a lot done yesterday, and this morning, awoke to find it grey and foggy outside--perfect printing weather--so I got up early and started in again. By Noon I had the printing done except for some quick little touches: the wooden bar holding out the arms was pink--needed to be overprinted to brown and the little seal at the bottom was blotchy and had a light glaze of quinacridine coral added. So, I think it's "done". 4 blocks, about 6 colors and 9-10 impressions. Printed on Echizen Kozo natural washi. "unfinished". 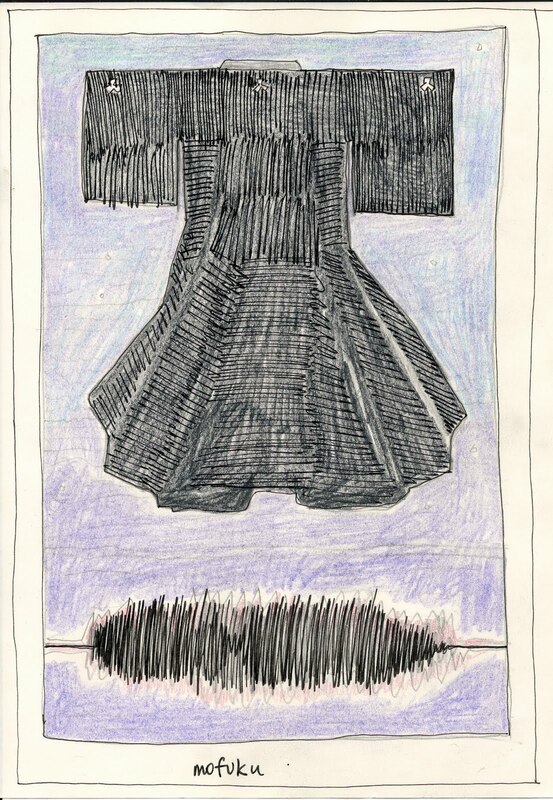 I had liked my other color proof; the darker orange/grey background did make the kimono shape float and while a bit more drab was more striking due to the contrast. I chose the green instead as more jewel-like and I liked the connotation of the glowing green background. I had planned and ditched a block that would have had the subtle shadows and creases of the silk kimono as being unnecessary and too busy. I'll pull out the 31 I need for the exchange and from the remaining 10 or so I may pull out the few that are too pale or too green and have a go at glazing a darker background again to see how they look. I still have one more day after all. 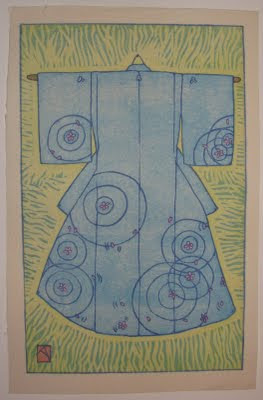 I managed to print a few proofs of the kimono print. While not quite what I envisioned, it is striking enough that I had to pause to decide what will stay and what will go. The blossoms are WAY too Pink/Mauve and will need to be much paler and more glowing. But it's the stripes in the background that I'm not sure of....I was afraid the pale simple background would be too still so I didn't totally clear the block. Since they are on the same block as the body of the kimono (blue) I'm a bit tethered as to how light and subtle I can make them and still make the kimono silk the right blue. I printed up four variants. I can see some adjustments that need to be made to the keyblock and I'll still need to carve one more block I think. I have a busy week of work so I'll mull this over before making any changes. This is my primary printing press. 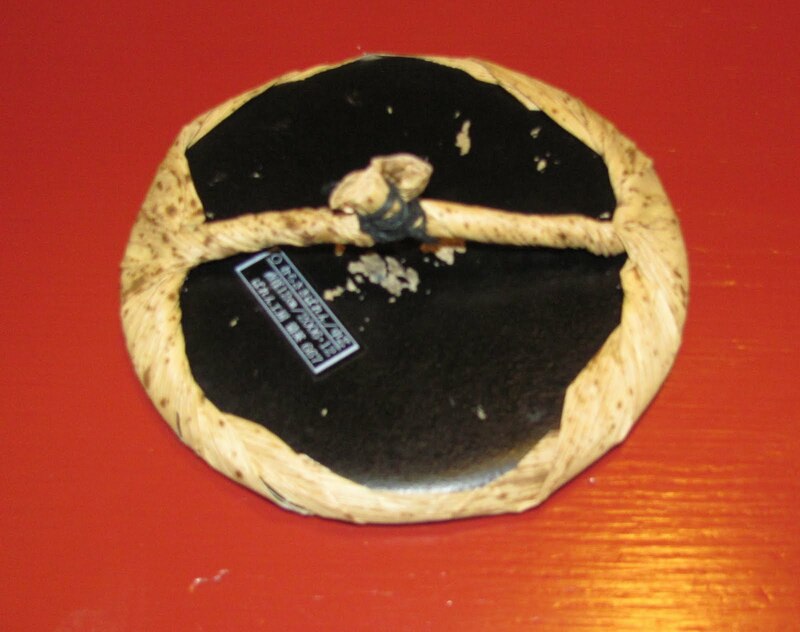 A Murasaki, Medium Baren made in Japan of braided hard nylon cord. 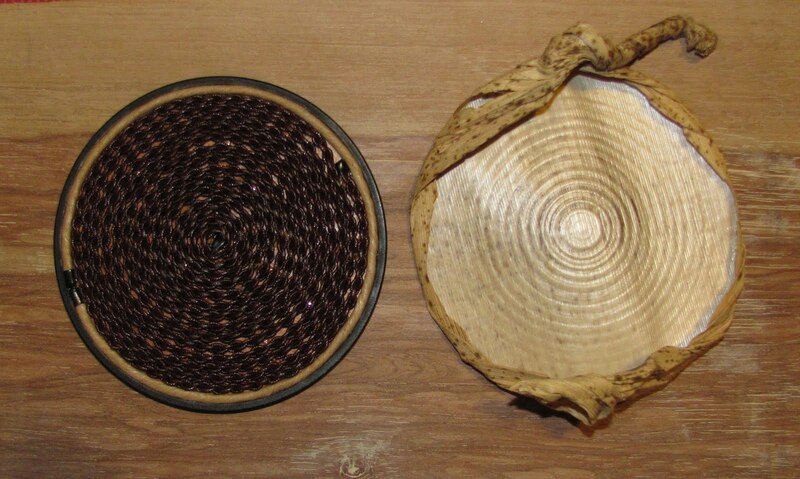 It is covered with a bamboo skin/leaf which, over time and with use will crack and wear out. I need to do some serious printing this week and the small concentric circular holes that were forming in the cover meant it was time to be replaced. The top photo shows the old cover removed from the baren itself. The bottom 2 photos show my fairly mediocre attempt to replace it. This is my second try ever. The first has lasted about 6 months, was serviceable if unevenly tied but seemed to work just fine. that will require me to replace it again fairly soon--the usual friction of regular printing will open/enlarge it. I may get through this print run as is, but if seems to be enlarging, it's more likely I'll have to do it all over. 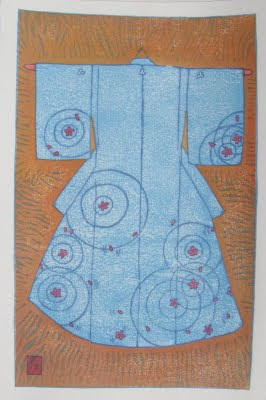 Kimono print. 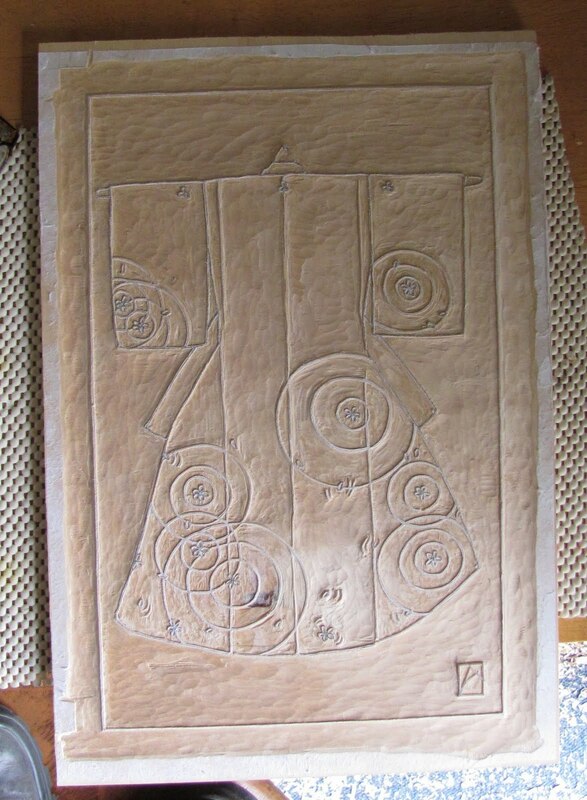 I have four blocks carved and want to see how it looks before I carve another. This baren cover should hold out at least that long. Well, I meant to include this photo in the last post but didn't have my camera and the sketch was too big for my scanner. 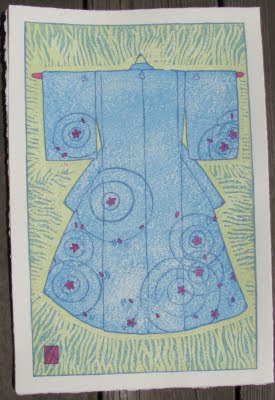 This is about a 11" X 16" board of Shina Plywood (a kind of Japanese Linden or Basswood). I have three of these for a total of six plates. 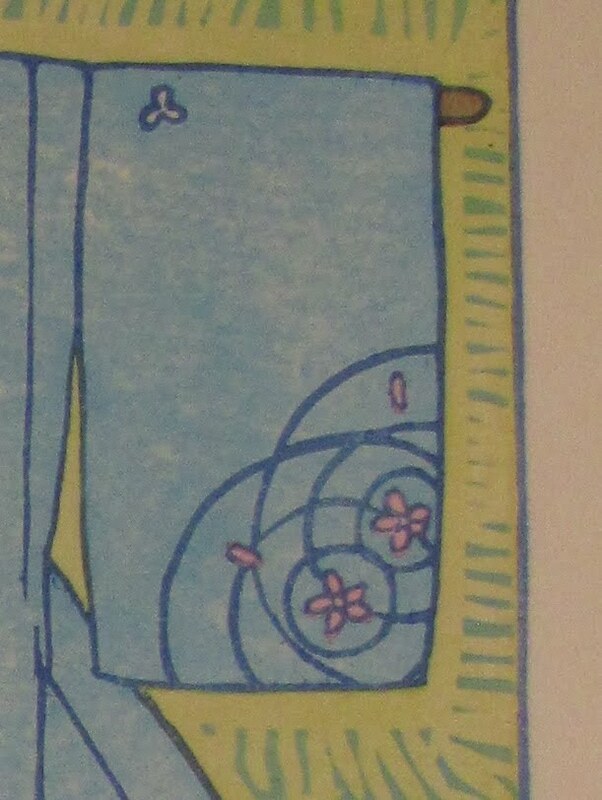 This is the almost finished keyblock for my effort for the Japan Relief print--if I can get it done in time. There's still to fix a few slips/lost lines and I have to carve the 4-5 color blocks that should go with this but this should be the bulk of the carving work. I'll be quiet for a while as I do need to work and I still have some details not quite worked out. I doubt this will offend anybody who isn't already aghast at what I was thinking before. The real fear now is that it won't be interesting. 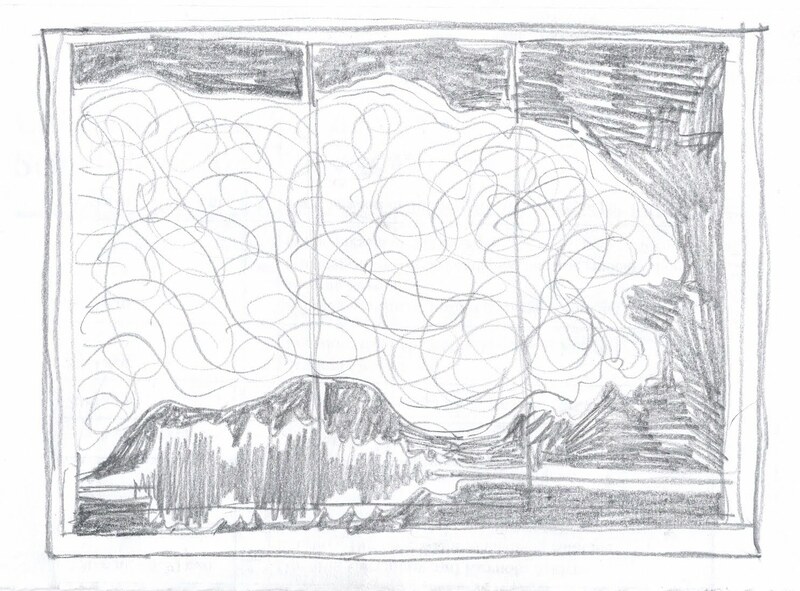 I've been drawing thumbnail and finished sketches and throwing them out as fast as I produce them. Most of the ideas haven't been too bad; it's just that they've been either too direct and blunt or just not nuanced enough to be interesting. I received a fair number of emails and private remarks about my last post and ultimately decided to listen to what seemed like good advice from others closer than I am to Japan. 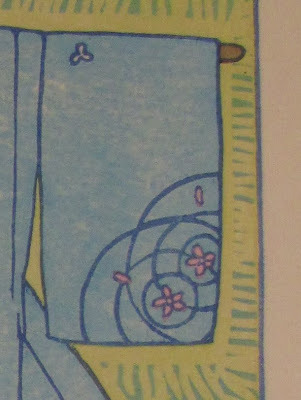 I have always loved Japanese folding screens and really liked the idea of the layers that would involve doing a woodblock print depicting one. I was interested in the the stillness of the usually hand-painted nature scenes but this would have had this big, rolling wave instead of the usual seasonal landscape. I got as far as this finished watercolor sketch (lots of other drawings with more or less insistent waves on them) but ditched it as just too insensitive to do at this time with so many people dead and missing. 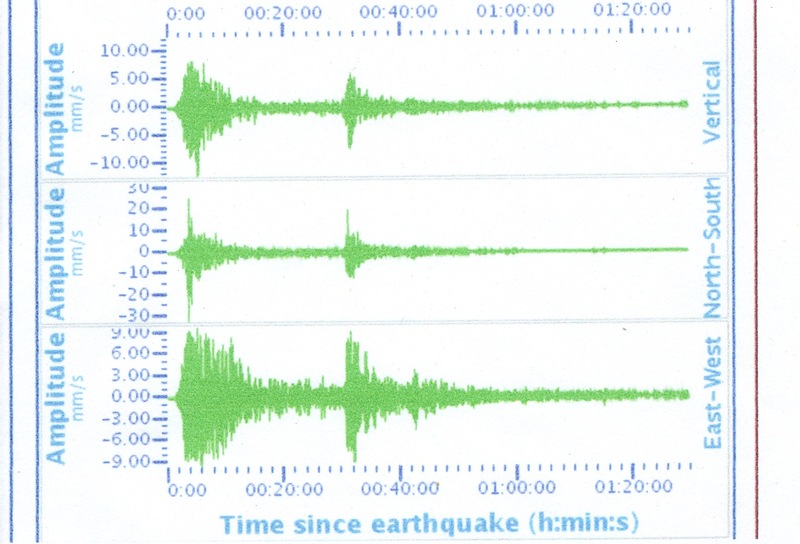 My other ideas involved carving and printing this seismogram reading taken off the coast of Sendai and recording the enormous earthquake near its epicenter. I had hoped to work it in as part of a print but found it didn't add much beside a macabre sense of tragedy and didn't like the drawings I had done that included it. Ultimately, I just started carving. water, a gentle reminder of the the passage of time and the fragility of life and a probably too-subtle nod to unstable atoms and electrons. But it's not obvious and risks being if anything too banal. 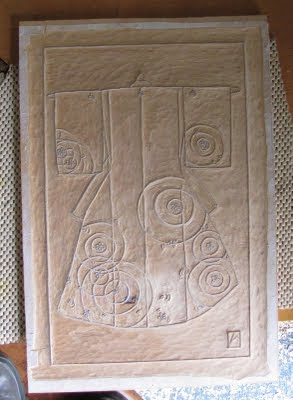 Hope to finish carving the keyblock tomorrow as good or bad, it will be a crunch to get it done on time. 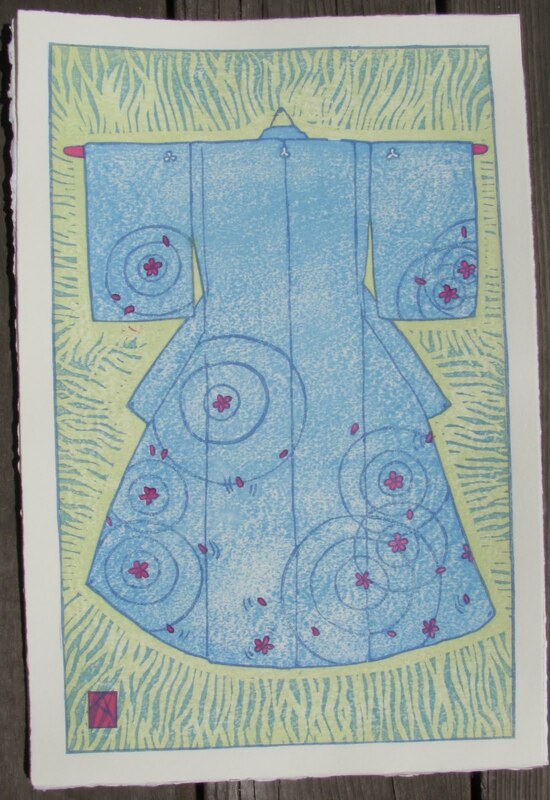 The Baren, an internet-based, international group of woodblock artists is sponsoring a benefit exchange of prints to benefit the Aid efforts following Japan's recent devastating earthquake, Tsunami and radiation disaster. 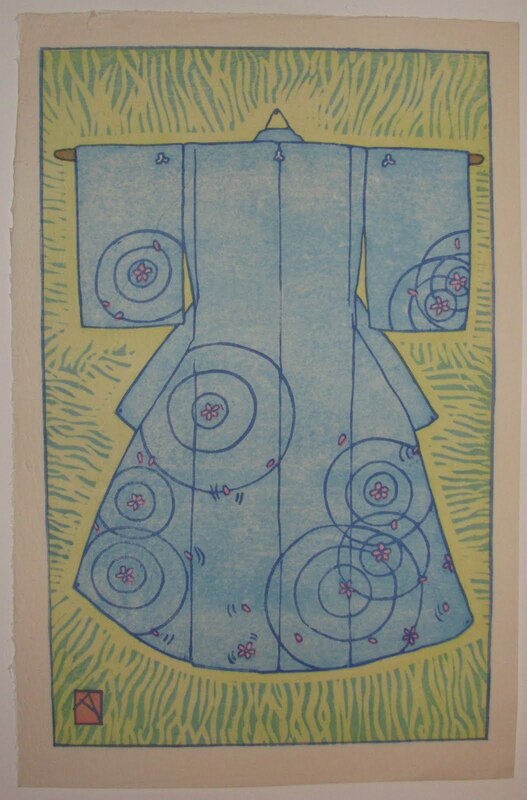 It is a themed exchange, titled "inspired by Japan" and the artists who have volunteered will print 31 copies to be exhibited and then, sold with all proceeds to benefit relief efforts. 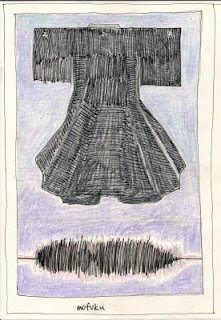 My first idea was to depict a "Mofuku", the all black, mourning kimono of Japanese funeral rites. 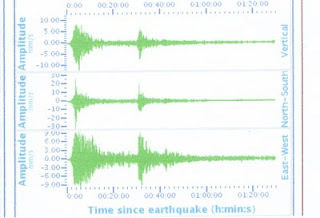 I had hoped to print a dark blue ground-to represent the water and the shadow cast of the kimono would be in the shape of the initial seismograph reading recorded off Sendai on that terrible morning. It was to be dedicated to all those who lost their entire families and have no one left to mourn them. But I've been a little uneasy. I've been scouring the web and internet sites devoted to Japanese culture, Kimono styles and traditions, and specifically sites selling used and vintage kimonos to the west. 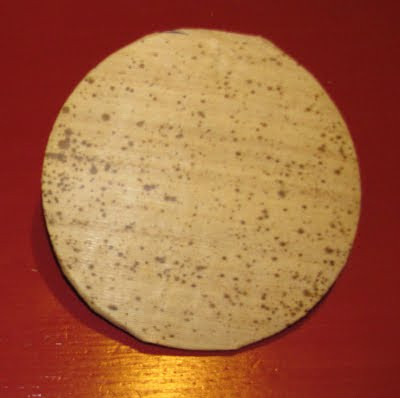 stated that they could not even show samples of Mofuku due to the sensitive nature of their use. Since, my print would make the display of such a seemingly sensitive object not only visible but the subject and focus I have been hesitant to begin carving. I showed some images of my sketches to my cousin's Japanese wife and she very graciously but pointedly confirmed my suspicions that while this would pose No issues to a Western audience, such a direct approach would make many Japanese uneasy. (As it did her). So now I don't know what to do. I have several other sketches--some more or less complicated that I need to revisit and decide soon if I can make them work. I would not normally be worried about appropriating ideas and images for my own work and purposes but in this context, a Benefit donation, it feels like I can not simply ignore such sentiment. 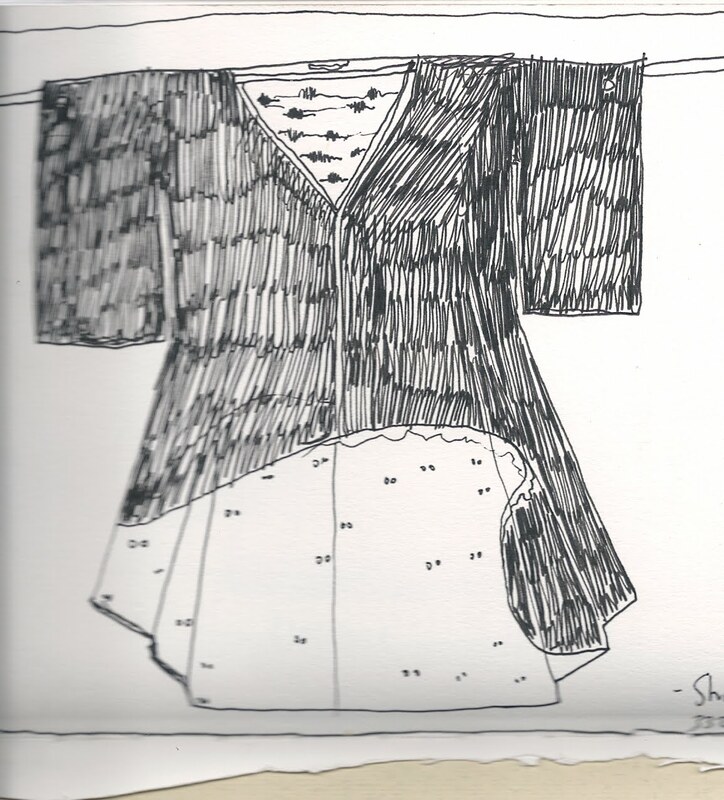 Fortunately, the traditions of kimono are fairly strict. If the kimono doesn't have the 5 mon (crests) or has any other decoration, it is NOT considered Mofuku. But it then loses the connotations I was after about the terrible loss of life and consequent national mourning and international sadness. Below was yesterday's sketch; done as Sami had Karate practice and I sat in the local coffeehouse with my sketchbook. Sort of a Japanese screen with an implacable wave. Perhaps a bit overdone/overwritten but it could be at least much more subtle and beautiful if printed well. My son made it into the State Science Fair and we drove to Los Angeles for two days of judging and exhibits. 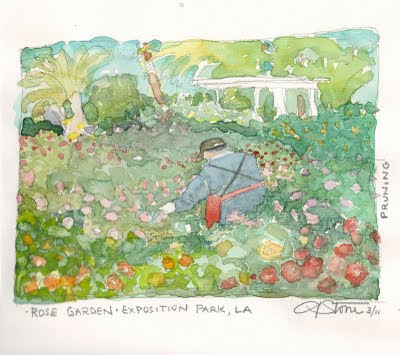 While he was explaining his project to the judges I went outside to explore the adjacent Rose Garden. 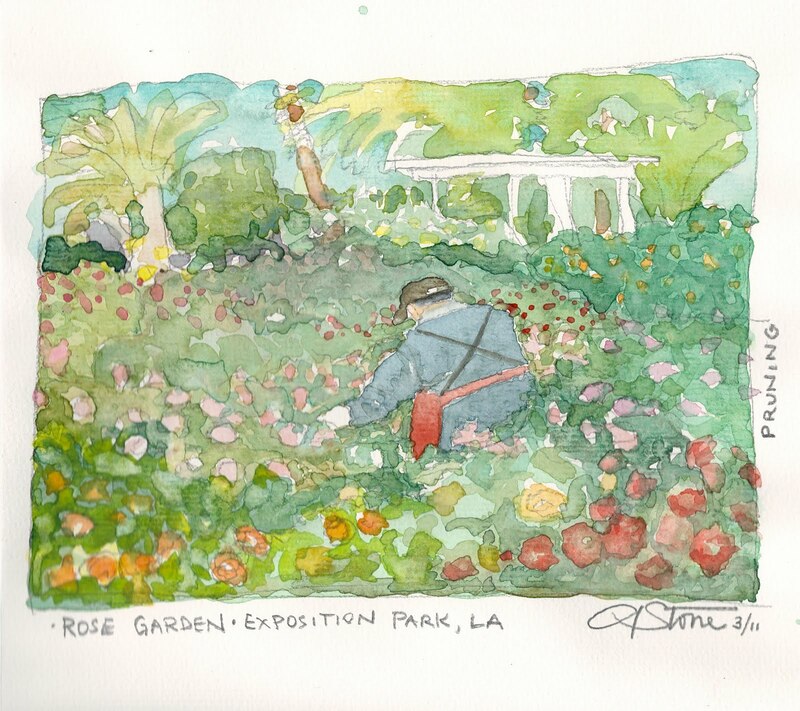 Exposition park has a very large formal garden planted to separate beds; one variety to each bed. So there are rectangles of white, red, yellow, mauve, purple and orange flowers. It was too hot to catch the scent unless you pushed your nose deep into the blossoms. 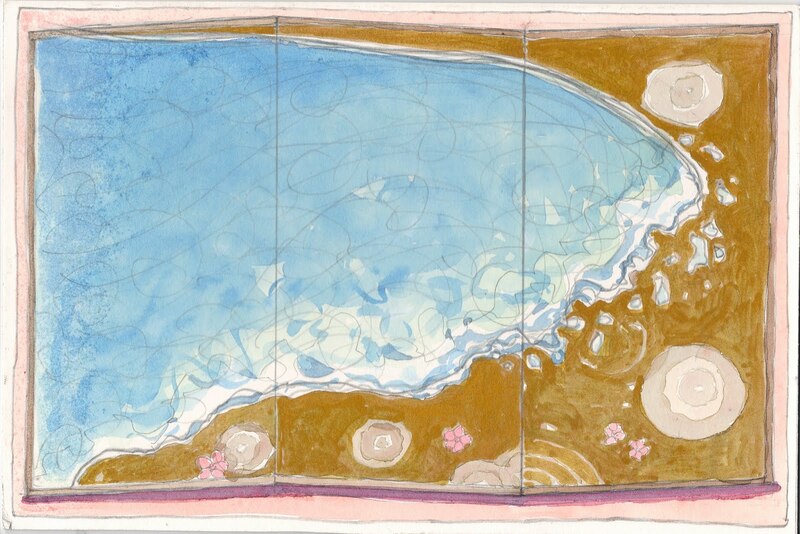 and the Beaux-Arts Style architecture; I pulled out my always-handy but rarely-used field sketchbook and colors. It was early morning and there were workers out pruning and watering. This man was heavily built and had a baseball cap, slate blue outfit and rust colored apron and white work gloves as he went about the beds deadheading and pruning out the still in FULL bloom May blossoming. This is somewhat compressed and made up. I did sketch the general layout but as I filled in the color I sort of abandoned the careful layout if favor of flowing greens and spots of color. It seemed to be favorite walking spot of elderly Korean women with colored umbrellas (for shade--it was 90F degrees yesterday) and big sneakers and white cotton gloves. They all stopped to look over my shoulder but were too polite to say anything. I like the riot of colors even if I had wanted the man to be lost in a sea of flowers but he ended up being the focus and subject.